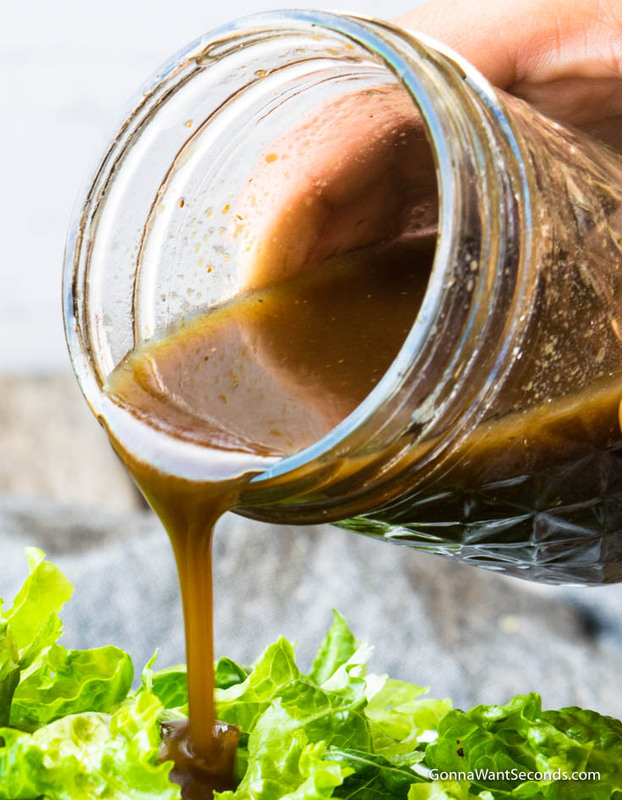 This essential balsamic vinaigrette recipe is tangy with a touch of sweetness. The secret is a spoonful of tasty Dijon mustard, which serves as an emulsifier and makes the dressing delightfully thick. Think about it…have you ever wanted to know what the secret is to making restaurant-quality salads at home? It’s in the dressing! A recipe for a basic balsamic vinaigrette for salads is one of the best tools a home cook can have in their arsenal. And fortunately, this one is as easy as combining the ingredients in a jar and giving it a good shake. I’ve found that the simpler a recipe is and the fewer the ingredients it has, the more important the quality of those ingredients is. There’s nothing to mask the flavor. You’ll have most of these ingredients on hand. 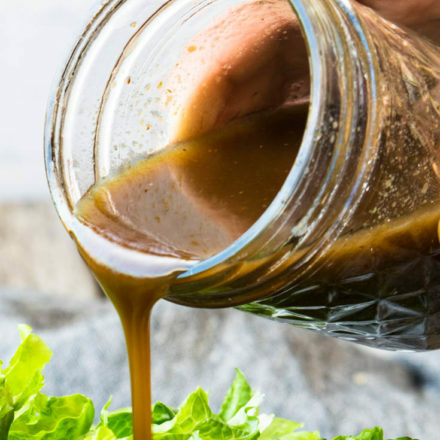 The versatility of this healthy balsamic vinaigrette recipe is off the charts – I’ve used it on salads, including my Portillo’s Chopped Salad and Mediterranean Salad. This will quickly become a staple in your home for years to come. Oh, and it’s not just for salads! It’s also delicious on roasted vegetables and drizzled over roasted or grilled chicken, easily creating a delicious recipe for balsamic vinaigrette chicken. So I’ll I’ve got to say, is pass the Balsamic vinaigrette, Baby! 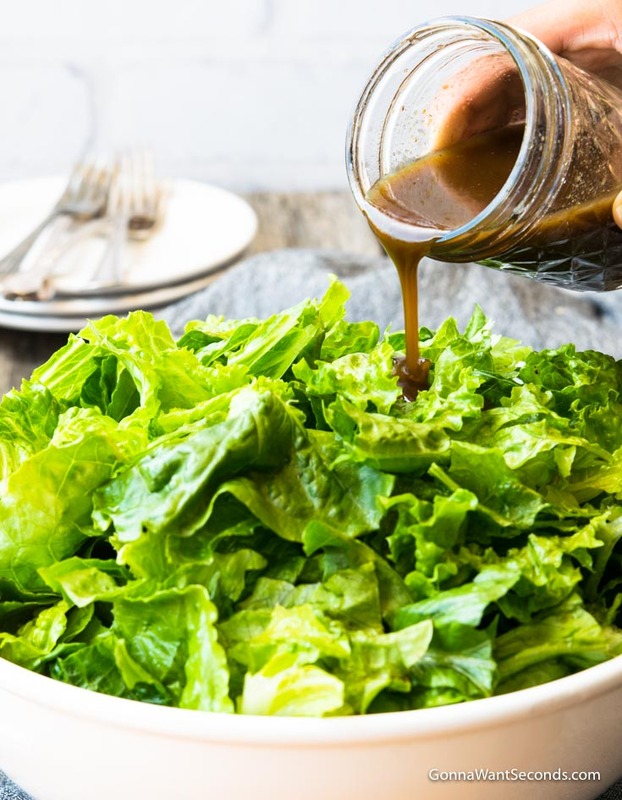 Balsamic Vinaigrette is a twist on a classic French vinaigrette, made with, of course, balsamic vinegar as the vinegar of choice. It has a sweeter overall flavor and is enhanced with a generous amount of fresh shallots and garlic. What is the ratio of olive oil to balsamic vinegar in a vinaigrette? A classic balsamic vinaigrette has a 3:1 ratio of oil to vinegar like the original classic French vinaigrette. Of course, everyone has their own preferences for this ratio. Even Jacques Pepin says that the traditional French vinaigrette proportions are a little too acidic for his taste! You can tweak the ratio to your taste; add more oil to make it richer, or add more vinegar if you like a sharper flavor. I love the mild acidity and sweetness. So quick and easy to make. So much better than any store-bought version! In a jar with a tightly fitting lid (I like to use a mason jar), add all ingredients and shake vigorously to combine. Alternately, you can add all ingredients except the olive oil to a small mixing bowl and whisk together until well combined. Then continue to whisk as you slowly drizzle in the olive oil. Add olive oil to the jar. Add Balsamic vinegar to the jar. Chop shallots very finely and add to the jar. Mince garlic and add to the jar. Measure out dijon mustard, Italian seasoning, sugar, black pepper, and salt and add to the jar. Shake well until combined and emulsified. 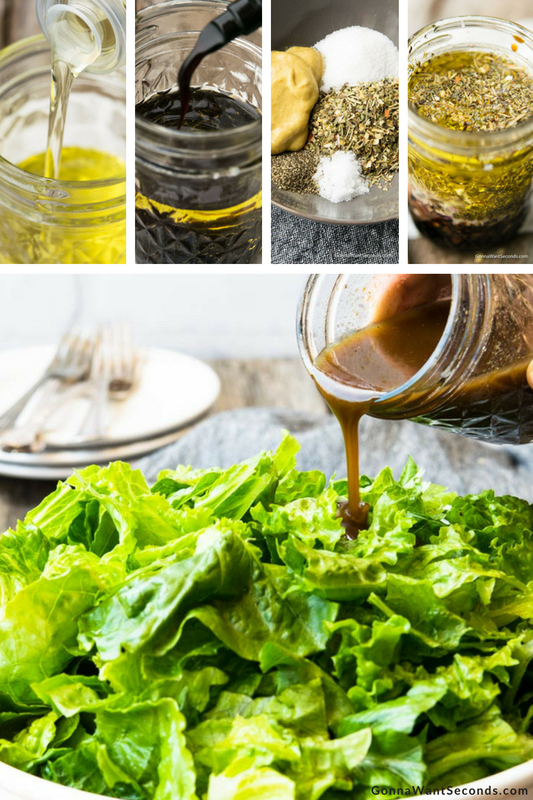 Our balsamic vinaigrette recipe will become your favorite salad dressing! Low in acid, with a delicious sweetness and great texture. So Easy to Make! In a jar with a tightly fitting lid, add all ingredients and shake vigorously to combine, or add all ingredients to a small mixing bowl and whisk together until well combined. Any leftovers can be kept in the fridge for 1 week. Balsamic Vinegar: Not all balsamic vinegar are created equal! I generally use a moderately priced balsamic vinegar from Trader Joes. Here’s an article on some ratings for other balsamic vinegars that might be helpful. It’s important to note that balsamic vinegar can be too acidic or bitter. 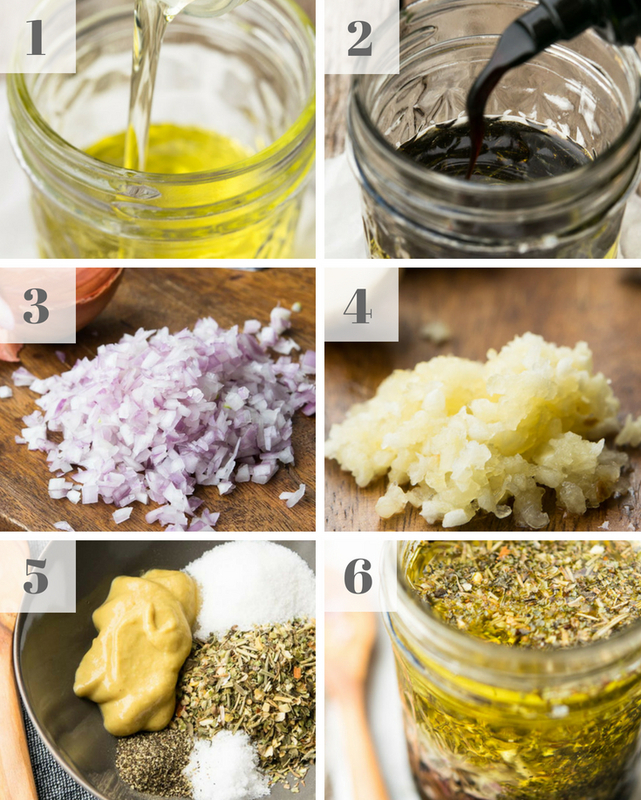 If you use a vinegar with one of these properties, your dressing won’t have the wonderful flavor we’re trying to create! Olive Oil: To create a balanced overall flavor, a good choice would be an extra virgin olive oil. It has a more delicate flavor and will blend nicely, adding some lovely aromatic qualities. Shallots: Shallots are part of the onion family and as such add some similar flavors while being more delicate and less pungent. They’re delicious when added raw. Fresh Garlic: Don’t skimp here – smelly hands are a small price to pay for the wonderful flavor fresh garlic gives to homemade dishes. Dijon Mustard: This condiment is a flavor powerhouse. Slightly spicier than regular mustard, and made with white wine this mustard brings a complex mustard-i-ness (is that a word? 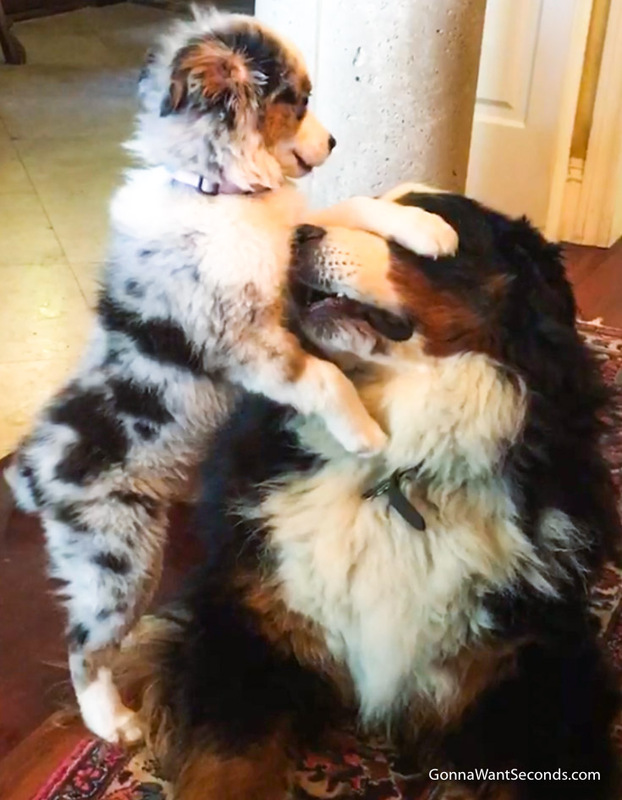 LOL) without being overbearing. It also helps the vinaigrette emulsify. Dried Italian Seasoning: Dried herbs have a stronger flavor than fresh herbs do. If you’d like to use fresh herbs instead of the dried mix, use about 3 times more fresh herbs than the dried herbs called for in the recipe. Variations: You can use this basic recipe as a template for all your vinaigrette desires. Acids: Switch out the balsamic for freshly-squeezed lemon juice or a good red wine vinegar. 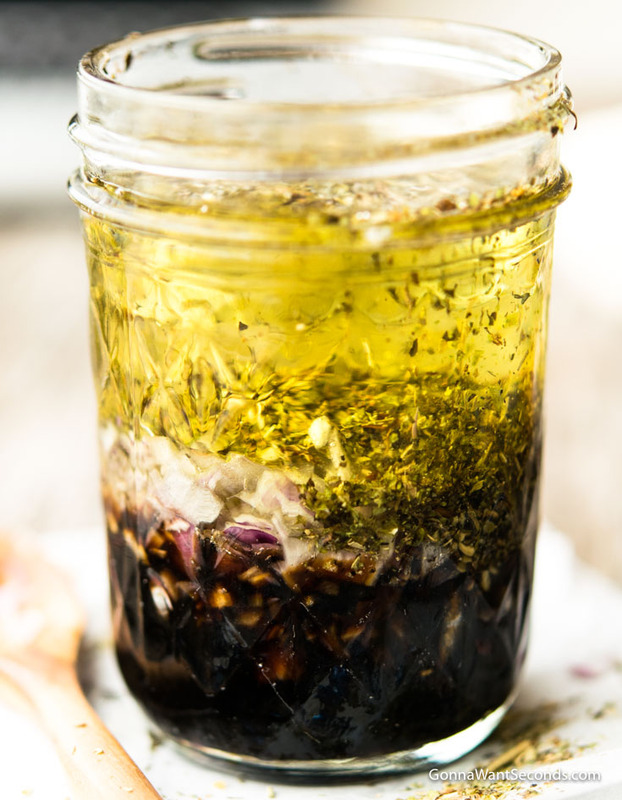 Flavored Oil: Infuse the olive oil with garlic or other spices to create another flavor layer. Creamy: For a creamy balsamic vinaigrette recipe, you can add 2-3 tablespoons mayonnaise and whisk vigorously until smooth. Sugar: Want to lower the overall sugar in your vinaigrette, omit it all together. The dressing will still have a lovely sweetness due to the balsamic vinegar. Honey: Another delicious version is our honey balsamic vinaigrette version. In lieu of sugar add 3 teaspoons – 1 Tablespoons of honey. Stevia: Another way to lower the sugar is to substitute it with Stevia. Stevia is significantly sweeter than regular sugar so begin with 1/8 of a teaspoon and increase slowly to achieve desired sweetness. Is balsamic vinaigrette salad dressing good for you? Your waistline may benefit from the yummy balsamic vinaigrette dressing that you use on your favorite salads. It has fewer calories than fat-laden dressings, and vinegar slows digestion to make you feel fuller sooner, thereby decreasing your desire to overeat. How do you store balsamic vinaigrette? Because our balsamic vinaigrette recipe contains fresh, perishable ingredients, it must be stored in the fridge. Airtight containers will keep it fresh up to a week in your refrigerator. The vinaigrette will separate as it sits but all it needs is a quick, vigorous shake, to restore it to its original consistency! Our healthy balsamic vinaigrette recipe combines healthy ingredients like olive oil, balsamic vinegar, fresh shallots and fresh garlic. Considered to be the cornerstone of the classic Mediterranean diet, olive oil is a top pick when choosing an oil that’s low in saturated fat. According to Dr. Oz, balsamic vinegar not only helps to prevent cardiac disease but also helps with your overall health.